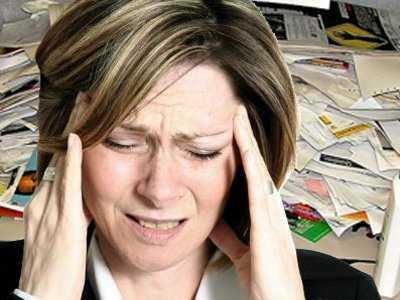 The way email works now gives a lot of people headaches. Everybody loves to complain about email. We get way too much of it, we can’t tell what’s important from what’s not, we never have time to respond. But all of a sudden, we’re seeing a new round of efforts to fix it. In the last few weeks, we’ve seen new email apps from big players like IBM, Cisco, and Microsoft. They join some other efforts that have been around for a while, plus a bunch of startups that would like to kill email entirely. Whatever the case is, they all have one common goal: making email less painful. IBM's Verse uses thumbnails to display people you correspond with. 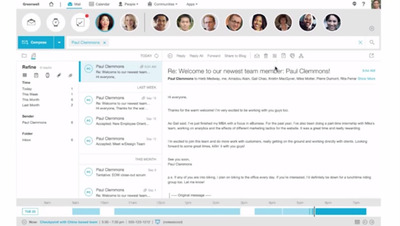 IBM released a free online email service called Verse on Tuesday. It is basically an email inbox with more social and analytics tools. For example, it can automatically prioritise emails based on data it collects from the user, and filter messages that it deems unimportant. It can also show the full correspondence with a particular group or individual by analysing other sources like instant messages and calendars, and even display the organizational chart of people included in email threads. IBM says it also plans to add Watson, its analytics solution, to the platform so users could search for any particular topic and get answers immediately. It's free for now, and IBM will add a paid version with more storage and other bells and whistles in January. 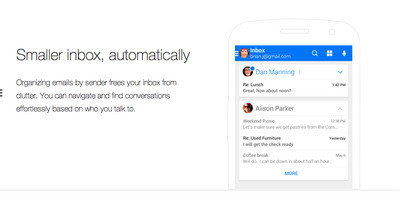 Google's Inbox is optimised for mobile users too. 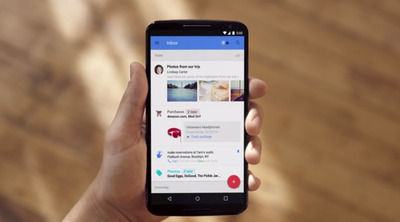 Google's Gmail team introduced a new app called Inbox last month. It can automatically bundle related messages together, while pulling in relevant information from the web for emails that need real-time information, like flight itineraries. It also gives the option to 'snooze' or 'pin' certain messages, or even set up 'reminder' emails that show up at the top of your inbox. Inbox is currently on beta and you can only add Gmail accounts to it. 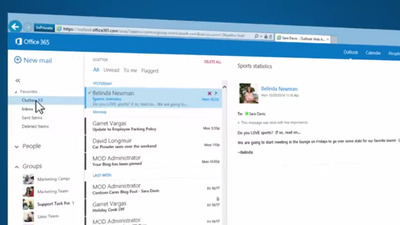 Microsoft's 'Clutter' uses machine learning to automatically sort your inbox. Microsoft's Office 365 rolled out a new feature called Clutter this month that automatically sorts and prioritizes emails based on your previous actions. Microsoft says it uses machine learning to determine what's important, and stores all emails that it thinks are unimportant in a separate folder called Clutter. Users can move certain emails to the Clutter folder on their own and go into the folder and see if they missed anything important, too. This feature is only available to Office 365's business users. WeMail organizes your email by sender. 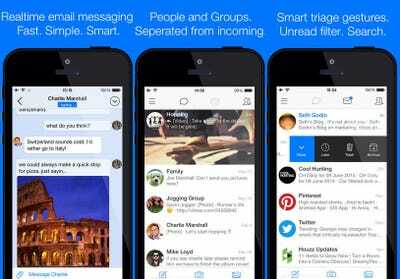 WeMail is a new smartphone app that makes email management easier on mobile. According to its founder Philip Yuen, WeMail allows users to manage their inbox with 80% fewer screen scrolls and 33% fewer taps. It sorts every email by sender, which decreases the clutter in your inbox, and even allows users to create emails with voice-messaging. TechCrunch reported on Tuesday that WeMail has raised $US1 million in funding from an investor group that includes Twitch co-founders Justin Kan and Emmett Shear, and Reddit founder Steve Huffman. Mailbox makes inbox management easy with a simple swipe. 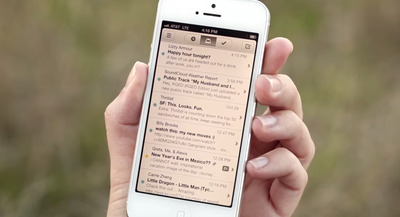 Mailbox was already picking up a lot of iPhone users when Dropbox decided to buy it for about $US100 million in 2013. It's much easier to sort emails with Mailbox, as you can simply swipe through messages to archive or trash them. It even lets the user 're-deliver' less important messages at a scheduled time. It syncs with Gmail, Yahoo, iCloud, and other email accounts, and is available for both the iPhone and Android. Hop is a little bit older -- it launched last year. It turns your email inbox into simplified chat threads. Its chat-like interface makes it easier to scroll through messages and you can send a file or photo by simply dropping it in the chat box. You can see in real time when someone's responding to a new email, and also make voice and video calls. 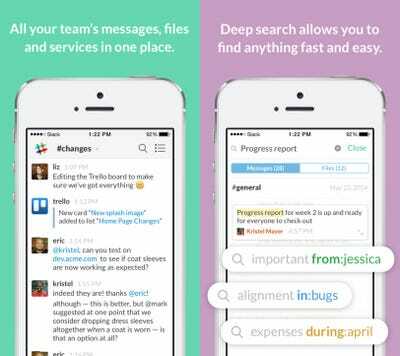 Here's how Slack looks like on mobile. Slack: One of the fastest growing enterprise apps ever, Slack is a work collaboration app that allows users to communicate and share files in one big chat room. It recently raised $US120 million at a $US1.1 billion valuation. Cisco's Project Squared:Cisco revealed a new app called Project Squared on Monday. It basically does everything Slack does, only with video and audio features. Users can communicate through the chat box, and even start a video conference right within it. Quip: Founded by Bret Taylor, Facebook's former chief technology officer, Quip is a work collaboration app that lets users to create documents and spreadsheets and communicate right within them. Users can edit and leave notes on the same file simultaneously, reducing the need to send email attachments. Evernote's Work Chat: Evernote released a new feature called 'Work Chat' last month, which allows users to share files without having to leave the Evernote app. It creates a chat box within the app, so users can talk to each other and share files, ultimately killing the need to send any email attachments. 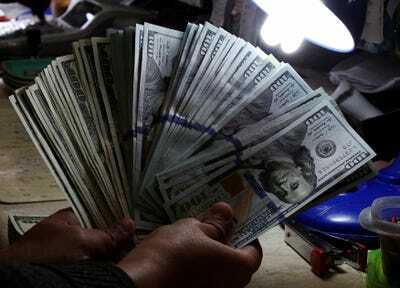 A money changer inspects U.S. dollar bills at a currency exchange in Manila January 15, 2014. Check out 9 of the highest valued startups!